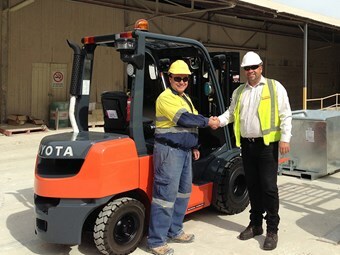 One of the most site-specific forklifts to be made by Toyota Material Handling Australia (TMHA) has been tailored for a Sibelco Australia limestone processing plant in New South Wales. Andrew Schneider (left) and TMHA's Richard Bopping with Sibelco's highly specified new Toyota 8-FD25 forklift. The new diesel-powered, 2.5-tonne 72-8FD25 forklift was delivered to the Charbon Lime plant, near Kandos, in October. Sibelco site maintenance supervisor Andrew Schneider says the new forklift operates on uneven ground. "It is the right tool for the right job," he says. "We asked for a limited-slip differential and wide, puncture-proof tyres, because the plant is located on the side of a hill and the ground conditions vary. "Most of the site has a concrete surface, but there is a lot of uneven gravel as well." The extensive fit-out for the machine also includes a custom hydraulic fork positioner, fork vibration damper, analogue weight gauge, dual-element cyclonic air filter, a pre cleaner, radiator screen, up-swept exhaust system, high-capacity alternator, high-capacity battery and fire extinguisher. Schneider says the new forklift has joined two older Toyota forklifts on site and performs a wide variety of roles. "The new Toyota has to be an all-rounder, because it serves as both a general-duties forklift and with the maintenance department. 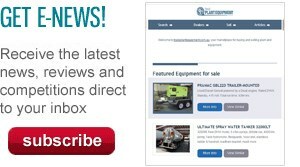 Duties range from loading and unloading trucks to lifting machinery parts with our jib attachment," he says. "It loads the bulka bags of lime powder we sell to mines in the Hunter Valley, unloads steel from trucks, carries the drums of oil we use to light the kilns and assists when we disassemble the fixed machinery for maintenance." Toyota's 72-8FD25 forklift is part of the company’s 8-Series range of counter-balance forklifts, which includes gas and diesel models, as well as a full range of battery electric machines. Safety features include Toyota's System of Active Stability (SAS) and Operator Presence Sensing (OPS) as standard features. "This is a great example of the level of customisation available to ensure our forklifts are perfectly matched to the customer's needs," says TMHA Orange branch manager Richard Bopping. "The diverse range of tasks this forklift undertakes is pretty impressive too."